The US Food and Drug Administration (FDA) recently announced the approval of a ketamine-based nasal spray for treating depression. Ketamine is a strong sedative and dissociative that has been used in the veterinary and medical fields since the 1960s, but it has also been known as a club drug for nearly just as long. The fact that this medication is a nasal spray is a bit ironic, considering that the drug was often snorted when used at parties. Numerous studies in recent years have shown that ketamine can be a good treatment option for major depression. Johnson & Johnson has developed a ketamine-based drug called esketamine, which has a slight chemical variation on the original substance. Once on the market, esketamine will be rebranded with the name Spravato. Last month, an FDA panel voted 14-2 in favor of approving a nasal spray version of esketamine for cases of major depression where other medication has failed. The panel stipulated that patients would be required to have tried at least two other therapies before obtaining a prescription for esketamine. Despite the overwhelming decision last month, it was unclear whether or not the FDA would actually take the advice of the panel and approve the medication due to the stigma associated with its illegal use. The FDA granted esketamine both Fast Track and Breakthrough Therapy designations. “The Spravato labeling contains a Boxed Warning that cautions that patients are at risk for sedation and difficulty with attention, judgment and thinking (dissociation), abuse and misuse, and suicidal thoughts and behaviors after administration of the drug. 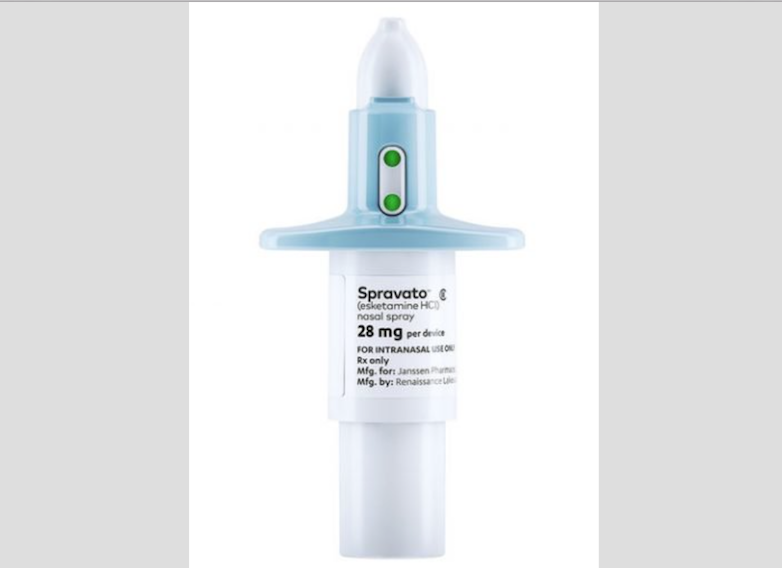 Because of the risk of sedation and dissociation, patients must be monitored by a health care provider for at least two hours after receiving their Spravato dose. The REMS requires the prescriber and the patient to both sign a Patient Enrollment Form that clearly states that the patient understands they should make arrangements to safely leave the health care setting to get home and that the patient should not drive or use heavy machinery for the rest of the day on which they receved [sic] the drug. Additionally, Spravato must be dispensed with a patient Medication Guide that outlines the drug’s uses and risks. To prevent the nasal spray from being used recreationally, a representative from Johnson & Johnson has said that the medication will not be sent home with patients, and can only be used under doctor supervision. Courtney Billington, president of Janssen Neuroscience, a subsidiary of Johnson & Johnson, says that very low doses will be administered in a professional setting. “Spravato will not be dispensed directly to a patient to take at home. It will only be available in approved and certified treatment centers. The amount of active ingredient that’s in this product, it’s at a very, very low dose,” Billington said. NextWhat Are The Differences Between Meat, Soy, Whey, Dairy, Hemp and Other Proteins?